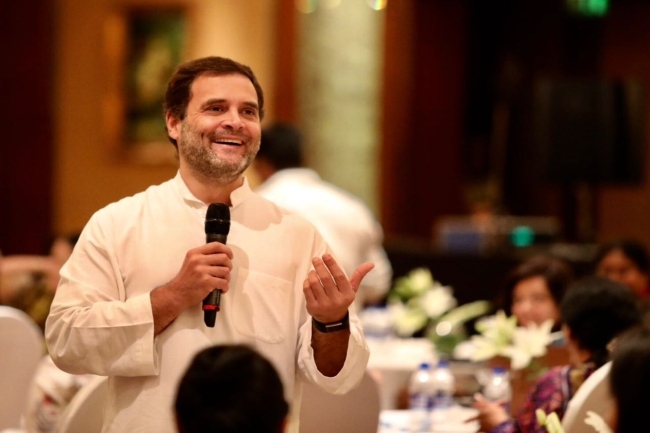 On the last day of his Telangana visit on Tuesday, Congress president Rahul Gandhi held a meeting with industrialists from the Telugu states. Interestingly, Andhra Pradesh Chief Minister Chandrababu Naidu’s daughter-in-law Nara Brahmani was also part of the discussion, despite the fact that the Congress and TDP are technically rival parties. Nara Brahmani is the the Executive Director of Heritage Foods Ltd, owned by the Chandrababu Naidu’s family. She is the daughter of actor-politician Balakrishna, and is married to the Chief Minister’s son and Andhra Minister of Information and Technology Nara Lokesh. The present market capital of Heritage Food Ltd is Rs 2,733.77 crore. The meeting was held at Taj Krishna, and close to 250 young CEOs participated in the interactive session. It was a closed-door discussion and media was barred from covering it. Others who participated in the discussion include producer Suresh Babu, and TDP leader JC Diwakar Reddy’s son JC Pavan. Speaking to media post the discussion, JC Pavan said that the agenda of the meeting was to discuss GST. “In the meeting, we spoke about demonetisation and GST. Rahul Gandhi assured us that he will revise the GST when the Congress comes into power.” Pavan further said that they also had a small discussion on Special Category Status to Andhra Pradesh. “He is committed to Special Category Status,” Pavan said. Suresh Babu meanwhile refused to give details of the off the record conversation, and said that the discussion was ‘positive’ and ‘good’. “He has a lot of good vision,” Suresh said. The presence of Brahmani and Andhra Pradesh cabinet minister N Lokesh, TG Bharath, son of TDP MP TG Venkatesh and some industrialists considered close to the TDP was significant in view of the recent political developments. Bharath told reporters that Rahul Gandhi promised that if voted to power at the Centre, the Congress would accord special category status to Andhra Pradesh as committed by the Congress-led UPA government in 2014 at the time of the bifurcation of Andhra Pradesh to carve out Telangana. In March, the TDP pulled of the BJP-led NDA over its refusal to accord the special status. Subsequently, Naidu had shared the dais with Rahul Gandhi during the swearing-in ceremony of HD Kumaraswamy as the Karnataka chief minister. Last month, the Congress party also backed the no-confidence motion moved by the TDP against the Narendra Modi government. 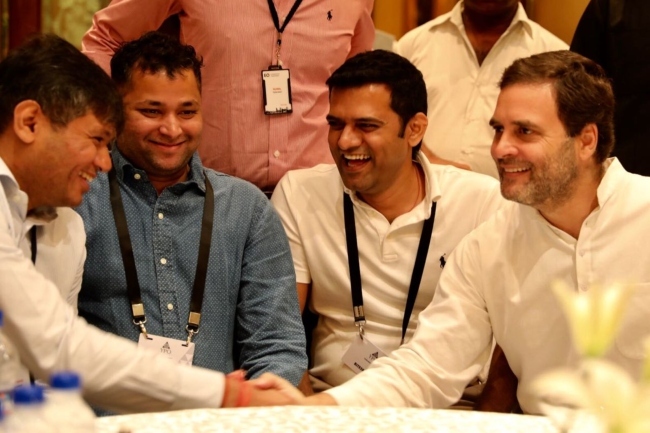 During the interaction with the industrialists, Rahul Gandhi shared his vision and what he plans to do for industry, especially the small and medium enterprises. He noted that demonetisation and the Goods and Services Tax (GST) had dealt a blow to the industry. According to Bharath, the Congress president promised to improve the implementation of the GST and address the concerns of the industry. Rahul Gandhi also promised to bring transparency for greater ease of doing business. The Congress president is on a two-day visit to Telangana. 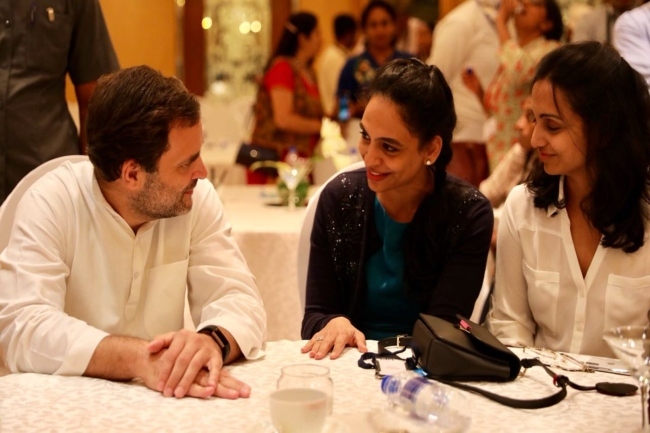 Earlier in the day, Rahul Gandhi also had an off-record/off-camera interactive session with media persons at Hotel Plaza. On Monday, addressing the gathering at the Prajachaitanya yatra meeting held at Serilingampally, Rahul came down on the TRS government. In a sharp attack, he said both KCR and Modi belong to the same category of people making tall promises and not delivering them. He further said that Telangana had become the capital of corruption and added that the state is being ruled by a single family. This remark was quickly countered by the Chief Minister’s son and Minister of Municipal Administration and Urban Development KT Rama Rao. “Irony just died a thousand deaths,” KTR tweeted. Later in the day, addressing the press conference, Chief Minister K Chandrasekhar Rao said that Rahul Gandhi should grow up and show some maturity.